The intriguing cat / fox character Ratchet and his robot buddy Clank enter into there second installment of the series by Sony Computer Entertainment Association. The plot of Going Commando pick up right after the first game. It makes mention of it several times, but is not so dependant upon it that you feel lost not having played the first game. After saving the world in the first game, you are hired by Ambercombie Fizzwiget to rescue a secret experiment that was stolen. As the game progresses you learn that the rescue of this experiment is vital to world security. Then you eventually have to rescue the world from yet another evil villain. While not the best plot ever found in a video game, it ties the rounds and rounds of destruction, and annihilation together admirably. 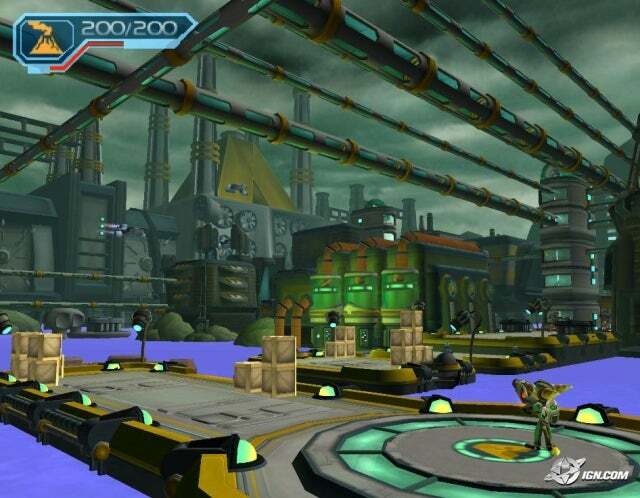 Ratchet and Clank in a sort of hybrid of many game-styles, and creates as a sort of new genre. It\'s a third-person, gadget, platform, shooter. Massive battles with cool, and unusual weapons make up the majority of game. The basic weapons Ratchet has is his trusty wrench. He wields it as a sort of double-headed axe, and is useful for smashing boxes, taking out small enemies that come too close, and if you\'re low on ammo. The other weapons in Ratchet and Clank are very numerous, and fun to use. From a machine gun to a remote-controlled spider bomb, there is a great variety of gadget available for purchase. After using a certain gun for a while you can level it up and increase its firepower and ammo capacity. You can also buy different suits of armor for better protection in battle. The unique weapons system is where Ratchet and Clank: Going Commando really stands out form other games. The sheer fun of massacring enemies with different, firepower make the game enjoyable. The graphics in Going Commando are top-notch and deserve notice. Cuts scenes look good. The levels feel large and each world is noticeably unique. The battle effects, intended to give a feeling of chaos and utter destruction, achieve that effect in every way. Gun effects are enjoyable and add excitement to battles. Everything looks smooth and feels lifelike. Ratchet, enemies, and NPCs look cartoonish, which is how they were intended to look. Overall the sound is very good. Voice acting is well done, and has a consistent feel. There is little music as battle noises make up the majority of the sound. Background sounds are subtle, but when looked at as a whole, give the game a incredibly real, lifelike experience. The game has an intended audience of teenagers, and this is evident throughout the game. The jokes in the game are aimed at teenagers, and overall the game give the impression of reaching that audience. Ratchet and Clank: Going Commando is rated Teen for \'Mild Violence.\' There is a lot of explosions and massive destruction, but enemies break into pieces and then blink-away. You can visit \'Slim Cogneto\' a shady vendor who can make some illegal modifications to your weapons, but this isn\'t necessary to complete the game. At the end of the game they mention a machine called the crotchenator, which the villain was a testing dummy for. Throughout the game I heard no swearing, and besides violence, the game is clean overall. Peanuts-Where\'s the Blanket Charlie Brown?